Today marks exactly 2 months since I had a spinal fusion (anterior / posterior fusion of L5/S1). In almost all ways, things are going much better than I expected — I think I’m surprising my doctors too! Here’s a summary of notes from my 6 week post-op visit, a shakedown of my medications and mobility progress, and my current exercise regimen — I’ve included some stellar news in that section too! At my 6 week post-op visit with the Physician’s Assistant, the first order of business was getting x-rays taken. 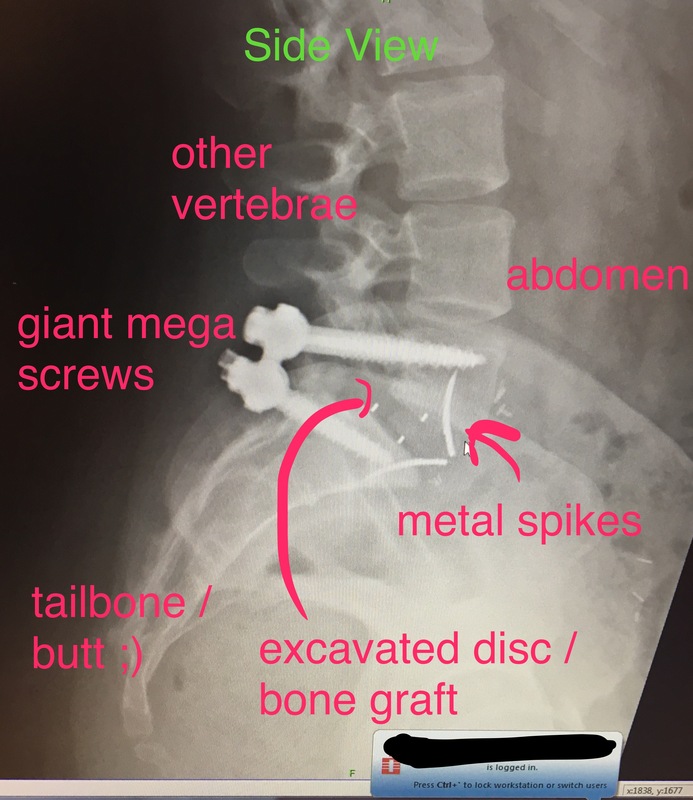 I was beyond excited to see the hardware that had been installed in my back for the first time. Here are the x-rays, with my layman’s comments added on top. That’s a serious pile of titantium hardware!! The Physician’s Assistant and I covered all the normal things. How much is your nerve pain reduced? By 70%, I told him. He confirmed that’s great progress, and some ongoing nerve pain is expected considering all the swelling that’s still present. My lower abdomen is still HUGE compared to its normal size, so I believe him. Wearing legitimate pants is a problem! The PA also said I could begin bending, lifting, and twisting to my pain tolerance. He said it would be nearly impossible to wreck the hardware at this point, but my risk of overdoing it is tearing muscles – EEEEK. Then the PA paused, and noticed the shirt I was wearing. “Oh, did you do the Lutsen 99er?” he asked. “Yes, I did.” He then asked “How long did it take you?” and I said “I don’t know, about 7 hours. Oh, and I won the women’s fatbike division.” He looked shocked (I don’t look all that athletic in street clothes .. I’m kind of a lump) and then said “Do NOT do anything stupid like that for AT LEAST a year. Ok? !” “Ok, fine …” I muttered. That was a little bit of a blow — I had hoped to train for spring and summer ultras next year. Maybe if I swear I’ll only do “long stuff” on pavement?! I’m hoping if I pester them enough, and they see how great my recovery is going, they’ll crack over time. Keep your fingers crossed for me please! We talked about my return to work and my ongoing fatigue. I’m sleeping 10-11 hours a day, either in a solid block at night or by adding in a midday nap. I’ve found through trial and error that I can be up and about for approximately 4 hours now, and then I need to lie down or my back will go into spasm. Since work is an “all or nothing” thing, they’ll reevaluate me at my 12 week post-op and I’ll likely go back to work then. I work in an office, technically, but we are also attached to a manufacturing facility so I move about a lot to get my job done. After I left the exam room, I saw my primary surgeon in the hall and he immediately came over and asked how I was doing, and then asked if I got new x-rays that day. I said yes, and he practically ran into an open exam room to pull them up. He looked like a happy kid at Christmas when he saw his handiwork and how great it looked. That’s reassuring! Then the PA paused, and noticed the shirt I was wearing. “Oh, did you do the Lutsen 99er?” he asked. “Yes, I did.” He then asked “How long did it take you?” and I said “I don’t know, about 7 hours. … He looked shocked (I don’t look all that athletic in street clothes .. I’m kind of a lump) and then said “Do NOT do anything stupid like that for AT LEAST a year. Ok? !” “Ok, fine …” I muttered. I’m MOSTLY off of all prescription pain and nerve medications at this point. I use a muscle relaxer and a heavy duty pain killer a few times a week, usually no more than 3, to manage breakthrough pain. The hard part is that usually my back doesn’t hurt and the muscles don’t spasm DURING the activity that’s bothersome — they wait until after to act up. I set my daily activity levels based on what worked over the past few days, and occasionally I do an experiment and push the envelope to see what new tricks I can do. I’ve been able to do more household tasks (doing “easy” loads of laundry like sheets and blankets, loading and unloading the dishwasher by doing squats to reach the lower items) while still avoiding any repetitive movements or bending (no vacuuming, no scrubbing countertops). I can’t do much cooking on the stovetop and can’t get food into and out of the oven without back spasm. Pre-made dinners, frozen meals, the microwave, and the toaster oven have been our saviors! I’m weaned off of ALL of the gabapentin now (see my 1 month update for my struggles). No more dizziness and memory loss while on the medication; and the withdrawal symptoms of headaches, anxiety, and insomnia are pretty much gone too. Ironically enough, now my dog Jack is taking gabapentin daily! He had an irritated spot on his flank and his obsessive chewing caused him to bite a hole in his flesh. I took him to the vet, and $600 later he was anesthetized, wound cleaned and patched up, and sent home with a mega-cone. Since he doesn’t need to operate a motor vehicle and is already a little blind and klutzy, I decided to take the vet’s advice and start him on the gabapentin. 😉 Jackie-pup seems happier than he has in a while so I may just leave him on the gabapentin! Exercise Progress – The Best News of All! I’ve been getting in massive amounts of exercise over the last 4 weeks. 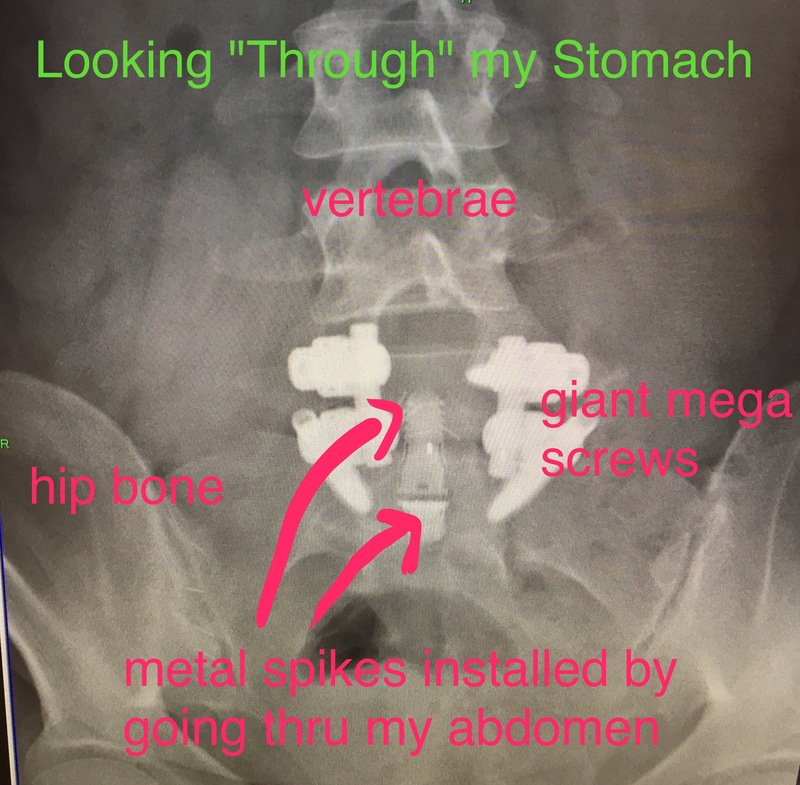 I kept the intensity dialed back before the 6 week post-op appointment, but once he told me I couldn’t damage the hardware I’ve been starting to push again. My legs are coming back! 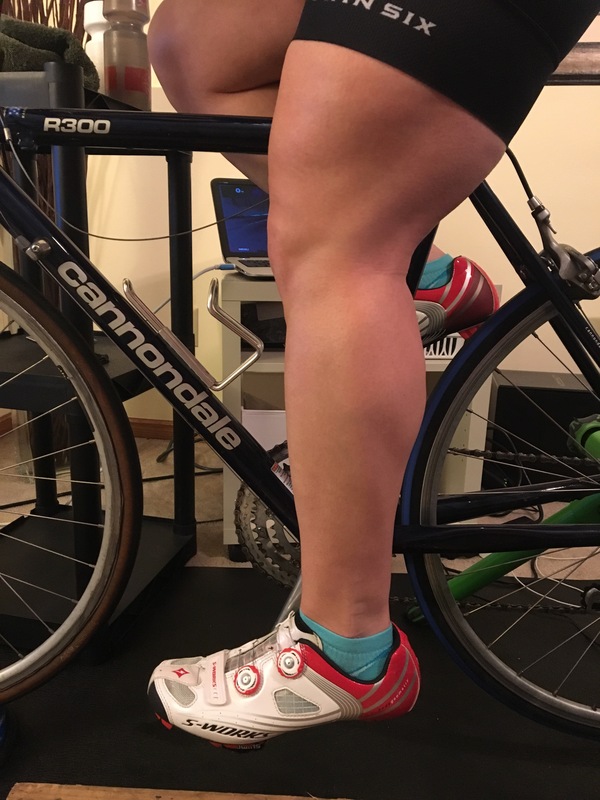 I stick to exercises that don’t aggravate my back — walking around the neighborhood at a fast clip on smooth, even pavement (I still trip a lot), and riding the modified bike on the trainer. Before surgery I could bike for about 10 minutes before my leg would have the pins and needles sensation and shooting pains. Now I can make it for about 2 hours before that kicks in! I even celebrated my 2 month post op by doing a 3+ hour ride on the trainer this weekend while seriously pushing myself. It was GREAT. The next day, I had all the acceptable muscle soreness in my quads, glutes, and hamstrings. Granted, my back was SORE so I know it’ll be a while before I attempt that stunt again. After a few days of pain killers I’m back to normal! Ha! My hours of exercise per week, based on Strava data. Holy bleep that’s a lot of time!! Wanna know a secret? Remember earlier when I said the PA blessed me to ride outdoors? That’s going fairly well too! I started with 5 minutes on a modified bike, then 10, 15, … etc. I made a “big jump” from 45 minutes to 60 minutes earlier this week and that ride went great. It was so amazing to feel like I was sailing along (I wasn’t) watching the scenery go by and feeling the wind in my hair. I’ve scoped out smooth pavement and have a few stretches that I like to ride, and as long as I’m careful not to use my core too much I can pull it off! Yeehah! If I’m careful, I hope to continue to add small chunks of time to my outdoor riding distance. I’ve trialed riding a block or two on gravel (it’s a little too bumpy) and also rode for about 15 minutes on the green trail at Lebanon on my duel suspension mountain bike. THAT was nerve-wracking!! I rode slowly, and it was hard for my foggy brain to process the twists and turns of the trail. The next day, it felt like someone was stabbing an ice pick into my abdomen randomly… Gotta wait a little longer before I try that again too! Overall, I’m thrilled with my progress! !